Lucy's Kitchen Notebook: Do You Know the Paris-Brest? 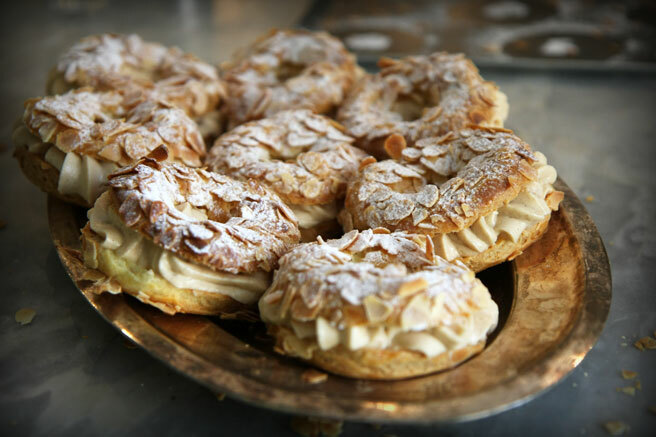 Do You Know the Paris-Brest? Individual Paris-Brest pastries (I made them the other day). We drove to Brest in Loic's 1983 Peugeot 104 in the year 2000, and what a ride it was. First of all, every time we got up to a speed of over about 40 miles per hour, there was no way to hear each other speak. The seals around the doors had long dried up. We were lost to our own thoughts for hours on end. We'd been married for about a month. We slowly rolled through French departmental routes, and were tailgated and dangerously swerved around through a panorama of overturned and burnt out automobiles in ditches, it seemed. It was the season. Even if it was dangerous to limp along the highway, where others came up on us suddenly, flashed lights, made gestures to sideswipe us and honked their horns to let us know we were not welcome on that road, the smaller routes were even worse. We were riding through a labyrinth. Thick brambles grew right to the side of the turning roads, transforming them into blind tunnels the further we penetrated into the depths of the Breton countryside. I wished Loic would slow down, so I could ponder the little crevices. There were little fanciful caves of greenery, pathways, visions, making me think of King Arthur and his knights. Rhythmic music was echoing in my mind, an ancestral hangover from the night before when we'd fallen by accident into a village Fest Noz where people who all looked the same cooked pork and cabbage in black cauldrons over hand dug pits on a hill. I wondered if I had it in my blood somehow, it had affected me so deeply. We'd watched stoned faced villagers stamping in circles in a strange distant cousin to the two-step. For this trip, I had wrapped my Japanese cleaver in a dish towel and tucked it into my duffel bag. It was a versatile knife, good for traveling, and it came in handy here and there. We broke out of the shaded rivulets of greenery into an open bare-faced town completely paved in concrete and stone, the town of Brest. We could see the sea's horizon-line from just about everywhere. One of Loic's old school friends lived there. We perched by small stone chapels knee deep in sunbathed coastal grass for photos, and I turned to face the sea, deep in my newlywed thoughts while they spoke at great length about people I didn't know in a language that I could barely understand. We had some crabs. I walked into their galley kitchen while the girl was whisking mayonnaise. She was using this eggbeater and at that point it was deep yellow, a thick viscous liquid. It splattered roughly and a dollop rolled down her sweater. I was gripped with the feeling I had walked in on something intimate to her. She looked up, afraid, and I left. They didn't have a sharp knife. They fell silent and looked at me strangely when I brought out the cleaver, it was clear that they had never had a house guest that carried a knife in her baggage. They got used to it soon enough when I whacked two huge freshly steamed crabs in half. It was my contribution. I first heard about the pastry called Paris-Brest in a reading in French language class a few months later. "Do you know the Paris-Brest? It is round, like a bicycle wheel, and very delicious" said the teacher. Round, like being enveloped in a vortex of sound, round like the circles they stamped in, like the reflection of a simple room in a spoon, like a glossy yellow orb that has spattered on the chest of a fine-haired girl whisking mayonnaise? "No, like a bicycle wheel." Alright then, I remember thinking. But now I understand. The best way to appreciate a Paris-Brest - cycle from just outside Paris to Brest and back in under four days in late August, 2015. Lucy, I don't know if I've ever BEEN somewhere so clearly through another's words. This will be a while digesting, whilst I re-read and absorb and just be there again. And I DO know those lovely wheels, for I fell in love with the word from a seventies Bon Appetit spread, in which the magnificent circle was displayed. The filling oozed in lovely thick swags down the sides, and the top was golden and wreathed in almond-slivered poufs of cream. And I made one. And quite a few others over the years, envying the people who had daily access to such wonderful fare. And I understand even more, now that you've told it to me. what a lovely memory...and my first car upon graduation from high school (1984) was a very old Peugeot and if you hadn't been able to so exactly describe the noise inside, I would have know exactly what you were talking about from experience! Lucy, please write a book, on any subject, so I can read more of your words, this blog is not enough. How luxuriant is that Paris-Brest, what a wonderful thing to make on a slow day. I've never eaten or made one, but it is high time! I love Paris Brest! It's been a while since I had one in Paris, but maybe I'll make it back soon! Thank you for the thoughts about the "chocolate" post---I'm lax about posting lately, with all the great lovely outdoors to sample and embrace, and a four-year-old to show it to me. And thank you for dropping in---every time I see your flag, I'm glad that you're here. Your visits and your words are a great honor, and I thank you. I recently discovered your blog and I love it! I'm 14 years old but I love cooking, and by that I don't mean simple things but complete diners. Your blog and your recipes are amazing! Some of the products we don't have in Holland but I can use other stuff! Thank you for sharing these things!